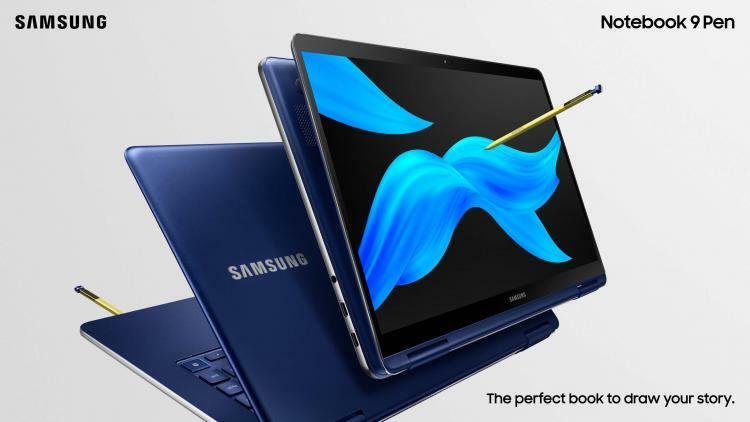 Samsung announces the new Notebook 9 Pen premium 2-in-1 PC with a built-in Samsung S Pen, a notebook geared towards the needs of content creators. It features a combination of power, style, and portability that’s perfect for users that want great flexibility where you can stay productive and creative wherever you are. The Samsung Notebook 9 Pen is available in 13-inch and 15-inch models, both powered by the 8th generation Intel Core i7 mobile processor. The next-generation Notebook 9 Pen features an all-metal and aluminium frame that’s designed to be stylish, lightweight, yet durable. It sports an edge-to-edge diamond cut metal finish giving it a premium look and feel. Using the S Pen, creativity can be unleashed to the fullest with its close to the pen-to-paper experience. The new S Pen also has a reduced latency of up to 2x from the previous model. The new S Pen also features customisable pen tips with three different choices to fit your task. To further enhance your S Pen experience, you can download the MyScript Nebo App from the Microsoft Store, a $7.99 value, for a free three-month trial that allows you to not only convert notes into digital text but also convert hand-drawn charts and diagrams, into cleaner versions. The Samsung Notebook 9 Pen is powered by the 8th generation Intel Core i7 mobile processor with fast charging capabilities and impressive battery life of up to 15 hours. It also features face and fingerprint log-in, ultra-fast NVMe PCIe storage, two versatile and high-speed Thunderbolt 3 ports, and the next-generation Gigabit WiFi support. The 15-inch model comes with the NVIDIA GeForce MX150 discrete graphics for smoother and more immersive visuals. The Notebook 9 Pen also packs AKG stereo speakers with ThunderAmp that delivers pristine and studio-quality audio. The Samsung Notebook 9 Pen 13” and 15” will be available in the U.S. in 2019.